RIDOT announces it has selected Michigan based, May Mobility to provide driverless buses for a pilot program in the Woonasquatucket Valley area of Providence. The Rhode Island Department of Transportation (RIDOT) today announced that it is has awarded a contract to May Mobility to deliver a limited and controlled automated vehicle service to help fill a transportation gap between downtown Providence and Olneyville via the Woonasquatucket River corridor. May Mobility was selected through a competitive request-for-proposals (RFP) process that started earlier this year. This pilot service will be available and free to the public for a year, during which time RIDOT will test and research a range of factors to better understand the potential of new technology to improve mobility options for Rhode Islanders. Through this public-private partnership, the company will begin a study and testing phase with small autonomous vehicle shuttles. Each vehicle will hold six people including a fleet attendant who will have the ability to fully control the vehicle at any time, further ensuring safety. The shuttles are fully electric, supporting the state’s environmental and emissions reductions goals. This first phase will begin over the winter months on low-volume, low-speed roadways in the Quonset Business Park in North Kingstown. The shuttle service is expected to be available to the public in the Woonasquatucket River corridor in Providence in late spring 2019. Information about the hours of operation, number of available vehicles and stops along the route will be announced well in advance of the start of service. RIDOT and May Mobility will develop a public education campaign including signs along the route and a website. Under the terms of the public-private partnership, RIDOT will contribute $800,000 for the first year of operation. This includes $300,000 of 100 percent federally funded research funds through the Federal Highway Administration and a $500,000 grant awarded by the R.I. Attorney General’s Office as part of a settlement with Volkswagen for violating Rhode Island’s laws prohibiting the sale and leasing of diesel vehicles equipped with illegal and undisclosed emissions control defeat device software. RIDOT’s contract with May Mobility includes options to extend the service for an additional two years. 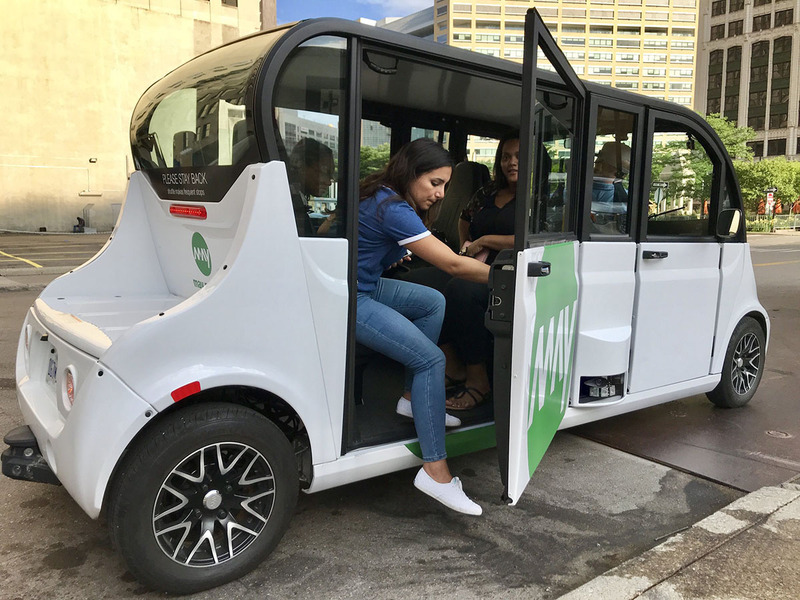 May Mobility is an Ann Arbor, Michigan based startup that is developing self-driving shuttles for college campuses, corporate clients, and central business districts. It launched a private corporate service in Detroit in June 2018 and has entered into agreements for public service routes in Columbus, Ohio and Grand Rapids, Michigan. “Now that we are well underway in executing the Governor’s RhodeWorks program, we are able to focus on improving our transportation system – and that includes pilot programs like this to look at how to safely integrate new technology into our planning in a very careful, measured manner,” said RIDOT Director Peter Alviti. “Our goal is to allow people to drive less and live more by making transportation more accessible and convenient for all. We’re thrilled to be partnering with RIDOT where our service will connect multiple communities both to each other and to mass transit – creating opportunities with a service that riders are going to love,” said May Mobility CEO Edwin Olson. “RIPTA is pleased to be a partner in our state’s first autonomous transit pilot. This new technology has real potential to provide safe, convenient transportation options and enhance our state’s public transit system. The autonomous shuttle service will connect to RIPTA’s bus service, providing another way to use transit to take you where you need to go,” said RIPTA CEO Scott Avedisian. RIDOT has committed to working cooperatively with the Amalgamated Transit Union as part of this pilot program which is designed to study the Union’s concerns. RIDOT will work with them to find beneficial solutions that address their concerns as RIDOT creates the transit system of tomorrow. Today’s announcement is the latest step in a multi-agency effort called the Rhode Island Transportation Innovation Partnership (TRIP) Mobility Challenge to explore new technologies in transportation. Among its many partners are the City of Providence, the Rhode Island Public Transit Authority (RIPTA), and the Quonset Development Corporation. I really like this idea. Hopefully it’s successful. What? Ok, don’t get me wrong, this is kinda cool and all but Olneyville to Providence has 4 very frequent buses, often don’t have to wait more than 5 minutes. Checking my transit app right now there is one in 1 min, then another in 4 min, then in 9 min then 15 min. I think we have Olneyville to KP very well covered. Still, that aside I’m looking forward to seeing how this plays out, more options can only be a good thing right? I guess? It seems these will have designated stops so it’s not going to be like a driverless Uber but more like a 4 passenger mini bus. This route is going to go through the Woonasquatucket valley, along probably Valley Street and Promenade/Kinsley Streets to the train station (I think it is not going to go to Kennedy Plaza). All the Olneyville service heads into Downtown via Westminster and Broadway now. The city is trying to incentivize development in the Valley and currently there is no direct transit service in that area. This service will also provide a more direct connection to the train station from the Valley and Olneyville, which better connects the areas to Boston. My concern, is that if we’re going to increase the jobs in the Valley, this shuttle is way too small, passenger-wise. The shuttle may be a short lived transition. Historically there were two bus routes through the valley area, a Promenade bus and an Orms Street bus that extended to Olneyville Sq. If either were recreated they could start at the train station. Right now people arriving at the train station have to take a cab or uber/lift to get to offices at Alco or in Eagle Sq. Walking is not reasonable to this area.